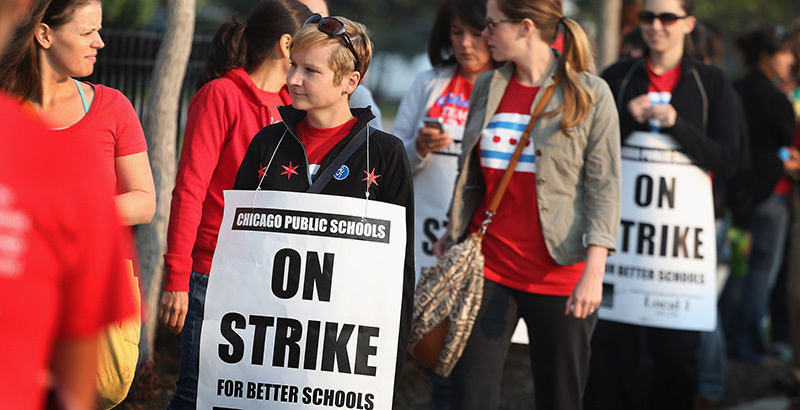 The Chicago Teachers Union is trying its best to pull a bait-and-switch on Chicago’s charter public school teachers. After years of working to stop charter public schools from opening and demeaning the hard work of charter school teachers, the union is trying a new role on for size: advocate for charter public school teachers. This may seem like a curious position for the union to take, given its years of animosity toward charter public schools. But upon closer examination, it makes sense. For years, the union tried to undermine charter public schools by attacking them rhetorically and spreading lies about their enrollment and academic performance. But that effort failed. Parents saw through the misinformation campaign; charters have grown to serve 56,000 Chicago students and are more popular than ever among the city’s parents. Now, rather than trying to weaken charters from the outside, the union has turned to an approach pioneered by the Greeks in Troy. It’s trying to position itself as an advocate for the very people it has worked to undermine for years — charter public school teachers. The end game, according to the union, is “for all charter teachers in Chicago to be part of the CTU,” leading to the same restrictive contracts that prevent progress in public school generally. With these contracts in place, charter schools could be forced to lay off non-teaching positions like social workers and counselors to pay for mandatory step-and-raise salary increases, shorten their school day to adhere to restrictive contracts, and make their curriculum less innovative. 1. The union lobbied aggressively against fair funding for charter school students for years. At a Chicago Public School budget hearing on Oct. 10, 2017, the leader of CTU ACTS — the union representing 20 percent of Chicago charter school teachers — called a new state law that mandated fair per-pupil funding for charter students a “bribe” and said that those who benefit are “privatization vultures.” To be clear, the people who benefited from this funding are charter public school students and teachers. For years, charter schools were severely underfunded by the state, often receiving just 73 cents on the dollar compared with other public school students. This legislation righted that wrong, allowing many charter schools to raise salaries for teachers and invest further in their classrooms. Yet, the union opposed the new funding. 2. The union has publicly campaigned against many charter schools, including schools it now claims to represent. In 2011, before the union decided to position itself as an advocate for charter schools, it suggested that one-third of UNO Charter School campuses (now Acero) should be closed. It also claimed stopping a UNO school from opening as one of the principal victories of its unionizing effort in Chicago. The union also publicly opposed the opening of the Noble Network’s Mansueto, Speer, and Noble Academy campuses. Today, the union wants to represent these schools. 3. The union has admitted that dues for charter teachers would likely rise after they joined the union. According to the union’s own website, “ChiACTS’ full-time dues are currently $693, and are likely to rise in coming months.” Especially after the recent Supreme Court Janus decision, the union needs to recruit new members to sustain its outsize political spending. By adding charter school members, the union will be able to continue to bankroll its anti-charter lobbying and campaign spending. In today’s political climate, it’s more important than ever to consider what our leaders do, not what they say. I hope charter public school teachers will look carefully at the union’s actions over the past 10 years before deciding whether to call it an advocate for their interests. Andrew Broy, a former public school teacher and civil rights lawyer, is president of the Illinois Network of Charter Schools, a group that supports and advocates on behalf of Illinois charter public schools. Andrew Broy is the president of the Illinois Network of Charter Schools; he previously worked as both a public school teacher and civil rights lawyer.